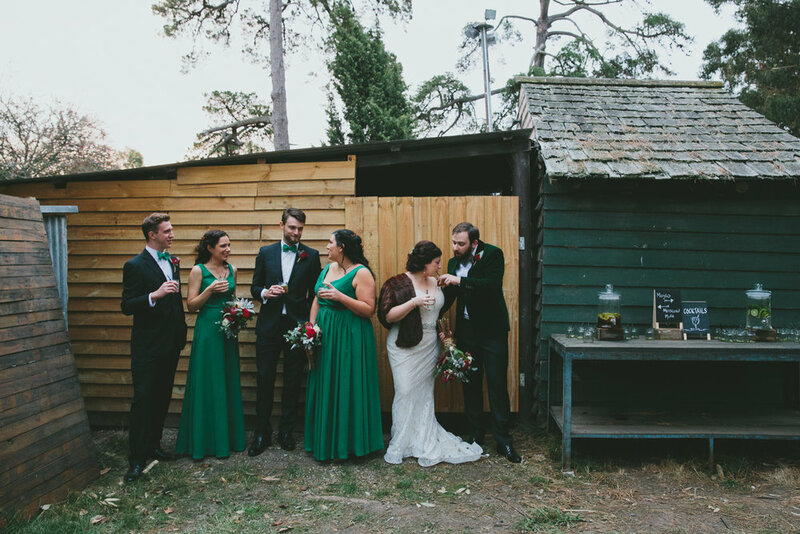 In April 2018 I got to marry Mike and Jacinta at Baxter Barn on the Mornington Peninsula in a romantic ceremony filled with tonnes of laughter and bags of personality. Surrounded by friends, family, great booze and excellent food these two beautiful people wanted a laid back, fun ceremony to start the day off right. Tell me about the proposal… JACINTA: We were on our first overseas trip together in Japan. We had already talked about marriage and gone ring browsing so we both knew it was on the cards. I had a feeling Mike was going to propose on the trip as I had called him one night before we left, and he was on his way into Melbourne to meet “some friend”. He had let slip he was in my parent’s neck of the woods and I thought “I reckon he has gone to ask for my Dad’s blessing”. So, the next day I messaged Dad and asked him how catching up with Mike went, to which I got a “yeah it was good he was in the area and just dropped round for dinner”. Two minutes later another text from Dad, “I am guessing you have read between the lines and know what this is about”. Another text two minutes later “Please don’t tell Mike I said anything”. Cheers Dad! We had been in Japan a few days and just finished a tour. We had a great day sightseeing, awesome dinner and then he dropped on one knee and proposed when we got back to our hotel room. It was very sweet and intimate. What was the first thing you decided on when you were arranging your day? J: Our photographer! I had seen Sarah’s work online when I first started wedding research (aka “oh crap where do I even start!”) and liked her look. We had her for our engagement photos and she just made us feel so comfortable, we knew we wanted her for our wedding. How did you choose your dress? J: I knew I wanted a retro style dress, but I also knew I did not want to spend a fortune. I had found a tea length dress online I liked but just wanted to try on a few different styles to make sure. I had a day off work and went to Bendigo Bridal Collections and ended up choosing the first one I tried on! I had a “oh I think this is my dress” emotional moment, and after lunch with a friend I could not get it out of my head, so I went and got it. What was the reason that you chose the venue that you did? J: Precious helped us! We had booked in with a different venue, however that fell through due to licence issues. We had already spoken to Precious about being our celebrant, and on hearing we had lost our first venue she asked us what we were looking for. Within a few days she had put out the feelers to her Celebrant community and come back to us with several recommendations and Baxter Barn was one of them. When we went for a visit we knew it was right for us. How did you both plan the wedding? Were there any major compromises made? MIKE: So….Jacinta works in projects and may have incorporated some work methodology into the wedding planning. We had a spare wall in our office covered in post-it notes, each with a task written on it that we would move between different columns from “To Do”, to “Doing” and “Complete”. It meant we could both manage the endless list of things to get through and both be on the same page about what needed to be done. It was also a pretty good feeling looking at the wall towards the end and realising the sheer magnitude of work we had gotten through as well. Like anything though there is a point where it becomes a chore, and you don’t have enough time to do everything you want to. For us we were lucky enough that we had several people who picked things up for us, for the others we would take the post-it off the wall, screw it up and throw it in the bin. How was the lead up to the wedding? Were you nervous? J: Michael is pretty go with the flow, but I was a stressed out and found that I could not relax until I had everything done. For me this meant bed time the night before! What was the best piece of advice you were given in the lead up? J: For organising a wedding - When it comes to the ins and outs of the wedding, ask your future husband what he is interested, and don’t try and push him into being interested in the other stuff - you will just make both of you miserable if you do. Is there anything you would change about your wedding day? J: I don’t think so – it was a pretty awesome day! What’s your best piece of advice for couples that are arranging their wedding? J: Those things you care about right now – come the day you really just won’t give a crap! You will stress, it will happen so just pick those things important to you to stress over. Dress comfortably!! Its gonna be a long day! Anything funny and unexpected happen on the day? J: Our bridal party surprised us during their speeches with a game – the one where they get you sitting back to back with one of each of your shoes and ask you questions designed to embarrass you. They had handed out cards to the audience with each of our first initials on them, so the audience got to play along with us – loads of fun! Photographer – Sarah Nalder. Venue – Baxter Barn. Catering – Baxter Barn. Cake – Family Friend. Invites – Self made. Dress – Bendigo Bridal Collections. Engagement Ring – Keshett. Wedding rings – Mikes is from Keshett and Jacinta’s was made by Larsen Jewellery. Suits – Pre-owned, Mikes jacket was from eBay. Her shoes – Florsheim. His shoes - Florsheim. Music – Playlist put together by our friends. Florist – Kira McNally.